Rong Khun village where is about 10 km south of Chiangrai city and only slightly off the super highway. It is designed by the national artist name Mr. Chalermchai Kositpipat. 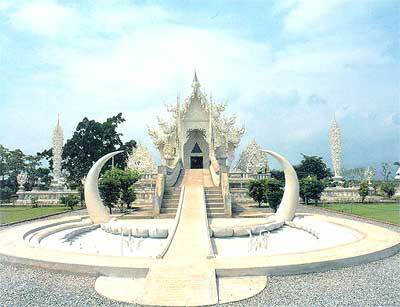 The main temple building or Ubosot is a distinctive white color and decorated with fragments of reflective glass and can be seen from afar. Painting and murals inside the temple are also very beautiful. After leaving the University, he decided to be a free-lance. He has continued artist works until he has now been a most famous artist of Thailand. Every year, he has been invited to demonstrate his artist works both in Thailand and abroad. He has still been granted funds by foreign cultural institutes. • The first prize of the 3th Bua Luang Art Exhibition,1977 B.E. • The wall painting of Wat Buddhapadipa, London, England, dedicated to the Buddha without any payment for him. • The illustration drawings in the Mahajanaka story composed by His Majesty the King. • The Art for Land Project at Wat Rong Khun, his homevillage. • The Honorary Doctorate Degree of Fine Art Science from the Ratchaphat Institute, Chiang Rai. • The Honorary Sign granted by The National Culture Committee Office in terms of painting. • The “Petch Siam” Honarary Certificate of Painting grated by The Chan Kasem Ratchaphat Institute. • The Department of Fine Art’s Adviser on the wall Paintings of Phra Phuttha Ratna Sathan in The Royal Grand Palace. • The National Bank’s Adviser on modeling the Banknotes in commemoration of the 50th Royal Wedding Anniversary. • The Working Committee in the National Artists Honouring Project held by The Ministry of Universites. • The Honorary Adviser to The Education and Culture Commission of Senate. It was my strong intention to build a temple in imitation of heaven. I wanted it to be a heaven on earth. I built a main building in the Buddhist monastery. I wanted it to be like a house of the Buddha with white color representing His purity and white glass representing His wisdom shining all over the earth and the universe. The bridge symbolizes transition from the cycle of life to the land of the Buddha. In front of the bridge is a small semicircle, representing the world. The large semicircle with the demon king’s fangs embodies passion and desire. We need to throw our passion and desire away into the mouth of the demon king to clean ourselves before going inside the main building. On each rail of the bridge are 8 monsters, totaling 16 monsters representing 16 types of passion. The middle of the bridge symbolizes Sumeru Mountain, which is the habitation of gods. The pond below stands for Sithandorn Ocean. Above the 6-layer heaven is the 16-layer Brahma’s land, represented by 16 magic lotuses surrounding the main building. The 4 biggest ones located beside the entry to the main building represent the shelters of the 4 great followers of the Buddha – Sodaban, Sakitakami, Anakami and Orahan. The semicircular in front of the stairway to the main building symbolizes the transcendental world of wisdom. The three steps of the stairway represent impermanence, sadness and non-selfness. Next to the stairway is the land of the formless divine represented by 4 magic lotuses and 4 doors. The last door contains triangular mirrors, representing emptiness (nothingness). Next to the door is the threshold to the land of the Buddha. On the 4-sided walls and the floor inside the main building are mural paintings in gold color, representing the release from passion and desire to the world of Dharma. I use the main apex to symbolize Buddhist Commandments. The apex comprises 4 animals representing the 4 elements of the earth; elephant representing land, naga representing water, swan representing wind and lion representing fire. All these animals are on their duty; to safeguard Buddhism. Thus, the main apex comprising the 4 elements of the earth symbolizes the 5 Commandments, the 8 Commandments, the 10 Commandments, the 227 Commandments and 84,000 codes of morality. The apex on the second level refers to consciousness represented by 2 animals: naga and swan. While the naga’s fangs symbolize evil, the swan symbolizes virtue. With the use of Buddhist Commandments, evil (passion) is killed. When we win over passion, sonsciousness occurs thus finally leading to wisdom. The top apex symbolizes wisdom represented by swan with garuda’s mouth crouching still. The swan seems not having any kind of passion but nothingness. Behind the top apex are a group of 7 designs representing the 7 Elements of Enlightenment and a group of 8 designs on the foundation of the umbrella representing the 8 Paths of Buddhism. The multi-tier umbrella itself symbolizes Nirvana.The pedestal below the top roof represents the 10 Fetters. On each pillar on the 4 corners of the main building are the flags representing respect paid to the Buddha according to the belief of the Lanna Region. Said above is only a short description of the main building. In fact, there is a lot more information as I plan to build 9 main buildings in total, each having Buddhist meanings. I want to create Buddhist arts on our land that are so great and splendid that the people around the world want to see them. I will dedicate all my life to this work. Also, I have at least 2 generations to continue it after my death. I estimate that it will take about 60-70 years to complete 9 main buildings. I am a professional painter who began to love painting at an early age. Since I intended to paint for a living, I have worked hard to practice and to improve my skills. Therefore, I was able to graduate from the two most distinguished art institutions in Thailand, the School of Fine Arts and Silpakorn University. I received the First Prize with Gold Medal from the National Arts Contest in 1977. Since then I have quitted submitting my works to such contests because I realized that achieving those awards was not the ultimate goal of my life. During the year 1980-1996, in order to get more experience and to disseminate Buddhist arts internationally, I traveled to present my works in several exhibitions in Asia, Europe, and the United States. I spent four years, from 1984-1988, in England doing mural painting for a Thai government’s temple in London called “Buddha Prateep Temple”. I did this job for free, considering it was a way to pay tribute to the Lord Buddha and to my country. I desire to be the one who brings the contemporary Buddhist art of my nation to the eyes of people around the world. I would like those people to feel the beauty of different emotions and philosophies. I have learned the Doctrine of Lord Buddha for over 20 years. I understand the truth of impermanence, which means emergence, existence and cessation of everything. I practice meditation and insight development to reduce defilement and desire. I adhere to the Buddhist law of moderation, both physically and mentally, which leads me to worldly and spiritually success. For my worldly success, I am famous and well accepted among people around the country. Many domestic and foreign art collectors are searching for my works, making them rare in the art market. After the year 1997, my works are invaluable and unavailable to buy.In 1995, I was honored by the royal grace to contribute several pieces of works to my beloved King. As for my spiritual success, I have more pleasant mind. I am happy and peaceful. I am no more distraught or striving as I was prior to my understanding of Buddha’s doctrime. Dharma(the doctrine or the teaching of Buddha) made me committed to be the one who contributed to other human beings on earth. I also determined to return my life to my country, my religion, and all people around the world. I wish to dedicate the most precious time of my life as a painter, by using all my intelligence, skills and imagination, to contribute to the world until the last day of my life. I stared my mission 3 years prior to my intended schedule. When I was 42, I began establishing Rong-Khun Temple at my hometown with the money accumulated over 20 years from selling my paintings. I wished to create the unique Buddhist art, which would become one of the greatest works of art on earth. I wished that all people around the world would be able to see the greatness of my beloved country. In 1977, I stared with building an ordination hall on the 1.2 Acres of land previously belonged to the Temple. In 2004, or 7 years from the beginning, the temple’s land has been expanded to 4.8 Acres thank to my purchase and to the contribution from Mr. Wanchai Witchayachakorn. Currently, approximately 60% of the ordination hall are completed. It is expected that the exterior part will be finished by the next 5-6 years. However, the interior part, which will be decorated by mural paintings, will need 8 more years to completion. Within the temple’s area, there will be 9 building with different shapes and characters. I intend to create the replica of the magnificent and resplendent heaven. I may not be able to live to complete the decoration of all 9 buildings. Art is long lasting, but live is too short. However, I expect that the overall architectural structure will be completed within the next 3 years, or by the year 2007. When I die, the team of my students will carry on my imagination to the completion of the work. I have already managed and prepared everything so that all the work can be continued after my death. As for those who have visited the Temple, don’t be worried or afraid that I will not be able to succeed just because the great amount of money is required whereas the amount of donation is limited to U.S.$ 250 per donor only. Money is not a big problem for me. To this day, I have paid more than 30 Million Baht, I am confident in myself. I am confident in my heart of a giver. Please don’t be worried. I do not wish to ask for money from anyone, even the government, non-government organizations, or wealthy persons. I do not want my idea to be under other people’s influence. I do not want anybody to cast his power over my imagination. I want freedom for creativity. I believe that, “The great amount of money always comes with the power of donors”. I have created the work of Buddhist art with my faith only. I do not want anything in return. I do not want, and do not like, making merit for credit or compliment. This Temple has never solicited contributions by robe-offering ceremonies and the like. This Temple is not built in rush to celebrate any occasion. My only desire is to make it the best and the most beautiful. I will dedicate myself until all my worldly and spiritual intelligence is all used up. Death is the only obstacle to my freedom of imagination.“ I’ve constructed a Thai temple with no intention to raise funds or pass the hat for money from anybody. The money, which offered or donated to the construction, has been from pure faith of Buddhists, who would like to support Buddhism and national cultural arts. I don’t need any donation from the ones who would like to get hidden benefits from their offerings”. Many people asked me what inspired me to dedicate all my heart, efforts and even my life to construction of temples. For me, I have 3 things to which I pay a lot more respect than to my humble life. And I hope that all Thais should also feel them at all their breaths. Nationalism- I was born on the land of Thailand in a small village named “Baan Rong Khun” in Chiang Rai. At the time I was born, there was no electricity in my village, I was born with the help of a midwife. My afterbirth fell on this land. I love my country. When I was young, I wanted to be soldier. But as I was not a good student but very good at drawing and painting. I dreamt that when I grew up, I would create the work of arts to mark our country’s heritage on the land where I was born. Religion- I was a bad boy when I was young. I was impatient, aggressive, light hearted and flirtatious. I used to injure my elder brother with a knife. I had many girlfriends and had venereal disease. After I finished my university education, I was even worse. My ego was high. My material desire was peak. I wanted to be notable and well known. I was jealous and boasing. Dharma of the Lord Buddha was some thing like a piece of rattan with sharp thorns. It stroke onto my rebellious heart. Sometimes, Dharma was like cool water to cool down the heat in my heart. It was also like warm water to warm up my heart when I was afraid of the facts of life. Now that I have used Dharma for 20 years to kill my passion. I finally found happiness, peace and wisdom. Not only myself but also my family, relatives and friends feel happy. Around me is smiles and laughings of inner happiness. I could feel the sound of happiness. I could feel the sound of happiness inside. Everybody has bright eyes. We all have high spirit. Dharma is really great. I was very grateful to it. It changes my life. If helps me understand things. With the rise of wisdom, understanding occurs. Now, I understand the facts of life cycle from birth to living and to death. For this reason, I promise with myself to dedicate all my life to Buddhism. I want to be the patron of Buddhism. I will make Buddhist arts the heritage of Thailand recognized by the people all over the globe. I was old enough to understand his wish. As such, I decided to focus my study on Thai arts in the hope that one day in the future, I would be able to produce that kind of arts for him. Finally, my dream came true. I went to England to make mural paintings at Buddha Pratheep Temple free of charge. I wanted to produce Thai contemporary arts that are unique for my beloved King. 4 years in England was the hardest time for me and all my friends from the Fine Art Faculty of Silpakorn University. Overwhelmed with tiredness. I thought of my beloved King. Then, I would recover and feel stronger. When writing the “Story of Makajanaka”, His Majesty the King wanted to have paintings included in his book. He mentioned the paintings made in a Thai temple in England, saying that those painting were contemporary and unique. I was selected to be part of the team to make the paintings for him. After that time, I was given honor in many other occasions to product the work of arts for him. Working very closely with His Majesty the King, I feel very proud of him. I can touch his genius and sympathy. I have strong impression with his contribution to the arts of our country. “ I wish to dedicate the best time of my life to producing Buddhist arts in Attribute to our beloved King, and I will do that with the cost of my life. • I, aged 6, saw my parents, grandparents, relatives and villagers join hand to build a small uposatha hall. • Later, the half-cement and half-wood hall was broken, improper for any Buddhist ceremonies and finally the dwelling place of a big host of bats. • My village is small and poor. The abbot is very old. • 1988 A.E., I came back from England, where I spent 4 years drawing Buddhist wall paintings of Wat Buddhapadipa for the Buddha worship, and had a chance to visit my homevillage, Seeing the broken hall, I felt sad and suddenly vowed to build a new hall. • For 9 years, I worked hard to collect money, By grace of the merit I made at Wat Buddhapadipa, I got money enough to build the hall on my own, without any donation. • I have started the construction since 1997 A.E., and expect to have completed within 10 years. • I wholehearteclly wish to produce and invaluable art work for my land. • In my mind, I have a signal to build a house for the Buddha. • White colour represents his purity. • Brilliant white mirror reflects the chabbannaransis (the 6 kinds of rays from his body), and also his wisdom spreading truths around the world. • 3-story choh phas on the hall’s front part as well Samadhi (Concentration), and Panna(Wisdom). They are bent upward the top of the canopy representiong Nibbana(Vidness). • 4 ray arches at the both sides of wayups represent the four kinds of Ariyas (noblemen) : Sotapanna, Sakadagami, Anagami, and Arohanta. • Bridge represents crossing a circle of life upward the heaven (the arch in the middle of the bridge), then upward the world of Rupa Brahma (the arch in front of the stairs), then upward the world of 4 Arupa Brahmas(3 entrance panes and a triangle above the major one), and finally upward Nibbana(Inside the hall). • Pond represents the Ocean of Sitandon, with 6 heaven in the middle of water. • The 4 inside walls of the hall contain gold paintings. The wall painting behind the major Buddha image shows the power of Metta(lovingkindness) transferred by the Buddha the rim of the Universe. The rest show his liberation from defilements to the Voidness. • The major Buddha image, made of while cement, enshrined on the gold lotus, represents his purity.